Apache Spark is another popular “Big Data” technology. Spark provides a lower entry level to the world of distributed computing by offering an easier to use, faster, and in-memory framework than the MapReduce framework. Apache Spark is intended to be used with any distributed storage, e.g. HDFS, Apache Cassandra with the Datastax’s spark-cassandra-connector and now the MongoDB's connector presented in this article. Predicates pushdown is an optimization from the Spark SQL's Catalyst optimizer to push the where filters and the select projections down to the datasource. 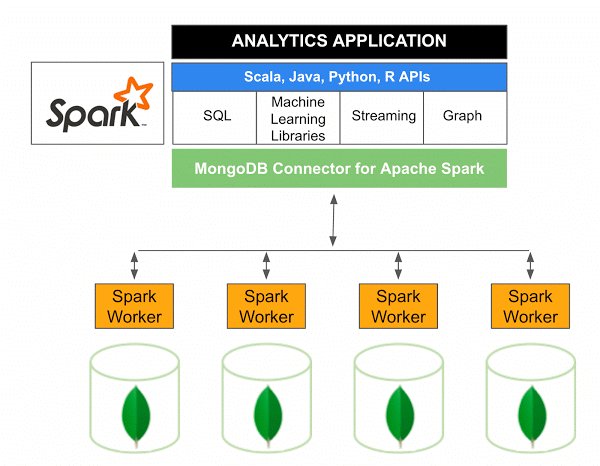 With MongoDB as the datasource, the connector will convert the Spark's filters to a MongoDB aggregation pipeline match. As a result, the actual filtering and projections are done on the MongoDB node before returning the data to the Spark node. The connector accepts MongoDB's pipeline definitions on a MongoRDD to execute aggregations on the MongoDB nodes instead of the Spark nodes. In reality, with most of the work to optimize the data load in the workers done automatically by the connector it should be used in rare cases.